Celebrating the life of Andrew J. Pater, Jr.
Obituary for Andrew J. Pater, Jr.
Andrew J. Pater, Jr. beloved husband of the late Maryann, father of Timothy (Nimrat) Pater, Richard (Rosa) Pater, Michael (Dipal) Pater and Daniel (Vicky) Pater; stepfather of Debbie, Brian (Cassie) and Jeffrey Weiland; grandfather of Jesse, Jasmine, Isabel, Richard, Rita, Daniel, Jr., Lilyanna, Blake, Mila and Brandon; brother of Marilyn Pater, Kathleen (Michael) Bojan and Gary (Mary Ann) Pater. 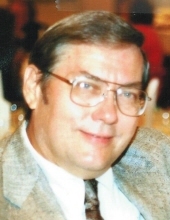 Funeral Monday, 9:30 a.m. from Linhart Funeral Home, 6820 West Cermak Road, Berwyn, IL to Saint Odilo Church. Mass 10:00 a.m. Cremation private. Visitation Sunday 3 to 8 p.m.
To send flowers or a remembrance gift to the family of Andrew J. Pater, Jr., please visit our Tribute Store. "Email Address" would like to share the life celebration of Andrew J. Pater, Jr.. Click on the "link" to go to share a favorite memory or leave a condolence message for the family.